Welcome to our live coverage of Phil Schiller’s MacWorld 2009 keynote. We are hoping and praying that the server holds out so we’re not trying any special tricks this time – just good old fashioned blog posting. To see updates, please hit F5 or Command-R to refresh. 10:32 – Tony Bennett is on stage. And we’re done. 10:31 – 15 Grammy Award winning artist is about to come on. 10:30 – Sync music across iPhone and Mac/PC whether you buy it on your iPhone or desktop. Starts today. 10:29 – iTunes music store on the iPhone now works over 3G! 10:28 – Next thing has to do with the iPhone. 10:27 – Plus: DRM free, 256 Kbps AAC encoding. major music companies are on board. 8 million songs are DRM free. By the end of the quarter all 10 million songs will be DRM-free. ALL SONGS! 10:25 – Price: 3 pricing tiers: 69 cents, 99 cents and $1.29. Coming in April. 10:25 – Six billion songs sold. Over 10 million songs. Over 75 million accounts with linked credit cards. 10:24 – One last thing. iTunes! 10:24 – We’re done. I think. 10:22 – One configuration. $2799. 17-inch LED display, 2.66GHz proc, 4GB of RAM, 320GB HDD. Ships later this month. 10:21 – 9600GT lasts seven hours. The 9400M will hold up to eight. 10:20 – Lasts up to five years so it’s a GREEN laptop. 10:18 – Adaptive charging reduces the wear and tear or recharging. 10:17 – Rather than cylindrical shape batteries they have these flat panel cells. Lithium Polymer battery. 10:17 – 40 percent larger battery but doesn’t weigh anymore than other batteries. 10:16 – Up to 8 hours. 1000 recharges. 10:15 – Longest lasting battery is in the 17-inch model. Video with engineers showing now. 10:13 – 17-inch anti-glare option with metal bezel. No glass screen. 10:12 – 0.98 inches thin. 6.6 pounds. 1900×1200 resolution. 700:1 contrast ratio. 60 percent greater color gamut. 10:11 – For the last 8 months the MacBook has been the number one selling laptop. 10:11 – Unibody 17-inch model. 10:10 – Launches today. One more thing! New 17-inch MacBook Pro! 10:10 – Free Beta for now. Paid service later. 10:07 – Multiple people can view and edit documents. Everyone can leave notes for everyone else to see. Microsoft Office users can view docs no problemo. 10:04 – Easily upload and notify, view docs online, share, edit and download. Demo is up now. 10:03 – iWork.com allows you to share your documents and is coming soon as a Beta. 10:02 – Mac Box Set is $169 and has Leopard, iWork and iLife in one package. Ships later this month. 10:02 – $79 upgrade or $99 for the family. iWork ’09 is $50 when buying a new Mac. Ships starting today. 10:00 – Charts with multiple axis. Charts updated in your Pages documents. "Linked Charts"
9:59 – More powerful functions and formulas. List of all functions available like Excel. 9:59 – Categorize by specific columns now. 9:58 – Numbers ’09 is getting an update. Listened to customers. There are now Table categories. 9:55 – Pages ’09 – full screen mode. Dynamic Outline (outline view). Mail merge with Numbers. Mathtype and EndNote integrated. 40 new templates. 9:55 – Portrait mode shows slide and notes. Landscope mode shows the slide that’s upcoming as well as the slide you’re on. Swipe to move forward. 9:54 – Keynote remote app for the iPhone and/or iPod Touch over Wi-Fi. 9:53 – "Chart animations" and "New themes"
9:52 – There are swing tansitions (Obama! ), anagram transitions encompass "Text Transitions"
9:51 – "Object transition" iPod Nanos are displayed in a row. They slowly drop off the screen and then album covers slowly replace them. 9:50 – Keynote now has "Magic Move"
This is the second thing for today. 9:49 – iWork ’09 is being updated. 9:48 – iWeb and iDVD are also being updated. Upgrade is $79. Family pack upgrade is $99 up to five comps. Shipping later this month. 9:47 – Artists give a background on the song they’re going to teach you. John Fogerty’s demo is now playing. 9:45 – Sarah Maclachlan. Ryan Tedder. Norah Jones. All on the piano teaching you how to play their tracks. 9:45 – Artists lessons. John Fogerty, Colbie Caillat. Patrick Stump. Sting. 9:44 – 9 basic lessons for guitar and piano. 9:43 – A guitar demo shows a video of a dude teaching you to play the guitar with the fretboard displaying as well. I think the tutor’s name is Tim. 9:42 – Garage Band ’09 now has instrument lessons. 9:40 – iMovie is super polished and looks professional. 9:39 – Video transitions are neat. 9:38 – Those effects include an "aging" effect that makes your video look super old school. 9:37 – You can video effects and slow down a segment of video like a fast moving animal or person and slow it down within the main video you’re editing. 9:36 – Whoa crazy. The video jittering fix (stabilization) actually works really well. For example: If you have two videos of the same scene but with differing angles you can stitch them together for a smooth transition like in Hollywood! 9:33 – Precision Editor allows you to transition separate videos together in an extremely precise manner. Oh sweet. When you skim a video you can grab a segment of it and drop it on top of another video and just select the audio to overlay. 9:31 – The new drop down menu in iMovie looks surprisingly like the new BlackBerry OS. Randy Ubillos, Chief Architect of Video Apps is on stage to give a demo of iMovie. "Precision Editor" for more precise editing along the timeline. 9:29 – "So much depth and so much power. This is going to be the video editing software that people want." 9:28 – iMovie is being updated. 9:27 – iPhoto ’09 demo is over. I think I’ll start using iPhoto once the update gets pushed out. I think they’re going to talk about apps more than anything. 9:26 – In iPhoto all your images have pins that show up on a map within iPhoto to show you where everything was taken. 9:25 – If your older images don’t have geotagging info you can input a bit of data and iPhoto tags the rest of the photos with that location on the map within iPhoto. 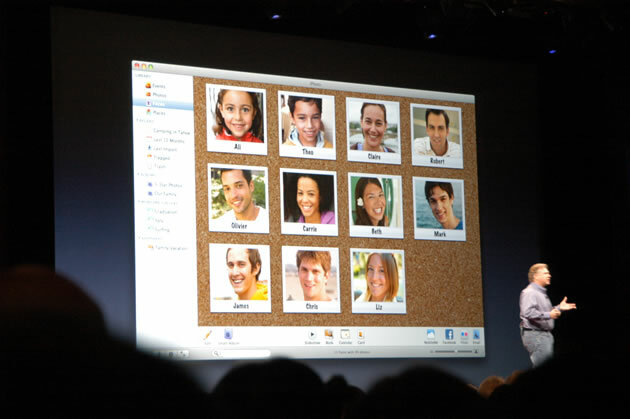 9:23 – iPhoto uses face detection to auto-detect people you pick going forward. It works quite well. Wonder how it does with multiple faces. You can create a "smart album" that picks people based on your preference and shows images of them together. Schiller is now giving a demo. When you upload an image you can tag people’s faces so iPhoto knows who is who and automatically detects certain people going forward. There’s a travel book photo album theme that includes maps of where your images are taken based on getoagging info. Sync with your iPhone and iPod Touch. Whoa. Crazy themes do 3D twisting transitions. Pretty cool stuff. Setup slideshows. Pick music or themes to go along with your images from within iPhoto. Flickr uploader has built-in geotagging. iPhoto has integrated Facebook and Flickr uploading. Places also integrates satellite imagery into iPhoto. Getting maps from Google Map service. Long and lat pinpoint specific locations. 9:13 – Gives the longitude and latitude. Duh. Sort through tons of images that iLife thinks is you or your gf/bf, etc. Face recognition – Finds images of people iLife thinks is the person you’re categorizing. Adding two new Events: Faces is one. Cork-board with thumbnails of people. Face detection is used. What’s new with iLife ’09? Brand new verison of iPhoto. 9:07 – Entire new version of iLife ’09. Two more things to talk about. 9:07 – Macs grew twice as fast as the PC market. 9:06 – Mac will be the focus. 9.7 million Macs were sold in FY 2008. 9:06 – I Love Apple! "People love the Apple store. They love touching our junk’ or something like that. 9:05 – This keynote is going to blow. I guarantee it! 9:04 – Schiller is on stage. "I can’t tell you how much I appreciate you all showing up." 9:03 – The woman sitting next to me is using an actual cassette tape recorder. She has no business being here. 9:03 – MobileCrunch intern Jeremy is handling images for us this keynote. 9:02 – I really hate Coldplay. 9:00 – We’re about to start. They’re telling us to turn our phones off. They’re playing that damn Coldplay song from the MacBook video. Philip Schiller is Apple’s senior vice president of Worldwide Product Marketing and reports to Apple’s CEO. Schiller is a member of Apple’s Executive Team and is responsible for the company’s Product Marketing, Developer Relations, and Business Marketing programs. Since rejoining Apple in April 1997, Schiller has helped the company return to its role as a technology innovator, delivering breakthrough products such as the iMac, MacBook, Airport, Xserve, Mac OS X, Safari, AppleTV, iPod and iPhone. Schiller has over twenty four years of marketing and management experience including seventeen years at Apple in various marketing management positions. Prior to Apple, Schiller served as Vice President of Product Marketing at Macromedia, Inc. of San Francisco, CA; as Director of Product Marketing at FirePower Systems, Inc. of Menlo Park, CA; as an Information Technology Manager at Nolan, Norton & Company of Lexington, MA; and as a Programmer and Systems Analyst at Massachusetts General Hospital in Boston, MA. 8:07 – Peter Ha sends this first image. A huge MacBook bigger than the Earth?